As garden fairies slept under shrubs nearby, I planted 1,100 Crocus corms, specifically several varieties of Crocus tommasinianus, in my back lawn, the Green Sea. I like to think that the garden fairies approved of my choice of flowers for the lawn because every time I returned from a break in planting, my gloves, trowel, and trug full of crocuses were all still there where I left them. This was not my first time to plant crocuses in the lawn. I planted several hundred in the lawn last fall. I don't know the specific number because I just wrote "planted a few crocus corms" in my garden journal on the day I planted them. I did not have a lot of time to plant last fall, and apparently less time to make a proper recording in my garden journal about what I planted. I think "a few corms" was a few hundred, if I recall correctly. I have been asked how one goes about planting so many corms in the lawn. 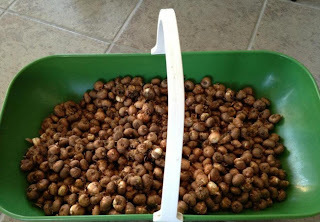 I find it easiest to plant all the corms if you empty them all into a low flat trug, mixing up all the varieties if they are packaged separately as mine were. 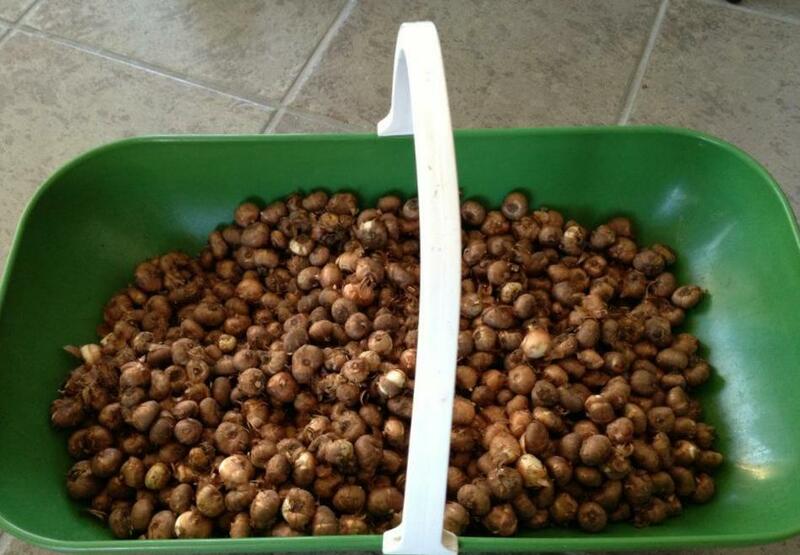 It makes it easier to grab a corm if you don't have to reach over the edge of a tall bucket or other container. 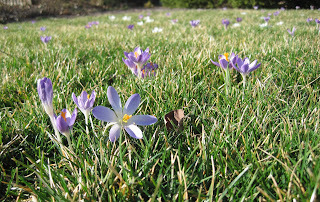 If I were planting these crocuses in a bare flower bed instead of my lawn, I would dig many large holes, not too deep, scatter the corms in the hole and then cover them up. However, I was planting these crocuses in my lawn so opted to plant them one at a time. With the right tool, which in my case is a rockery trowel, it took me about three hours, with several breaks, to plant these corms. The technique is easy and has a nice rhythm to it, once you get going. Clockwise, from the top left, grab your rockery trowel and a good pair of gloves. I used some of those gloves dipped in rubber because the ground was still heavy with dew when I started. Jab the trowel into the ground a few inches, then push it forward to create a hole. 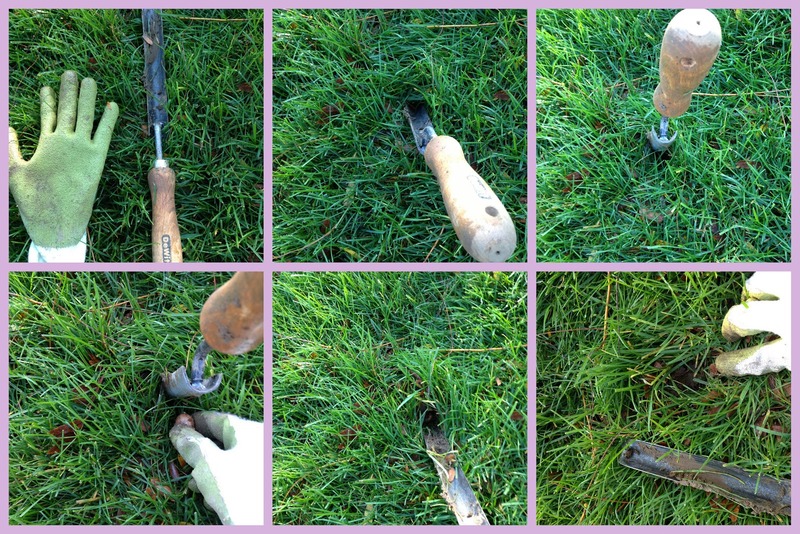 Drop a corm behind the trowel, then pull the trowel out and knock any dirt back into the hole. Repeat as many times as you have corms until you are finished. Don't try to plant in a pattern or straight lines. Just move about the lawn and plant around you, then move on to another spot, and another, and another until you run out of corms. Remember to take several breaks to stand up straight, stretch, and drink some water. I take a break every 25 minutes or so. Then when you are finished planting, go inside and tend to the blister on the palm of your hand, clean yourself up, and wait for the glorious show of spring. I am hopeful that these crocuses will bloom toward the end of March, specifically on Easter, March 31st, when I will host the world's greatest family Easter egg hunt. However, the first picture above was taken on March 13th this year, so I'm going to need some help from the weather and the garden fairies to hold off on the blooms until about two weeks later than that next spring. Regardless of when they bloom, I look forward to seeing them scattered throughout the lawn, the sign of a new spring in my garden. Hmm. I would like to figure out how to do this without the blister at the end. And what do you do when you hit rocks? Well, this makes my planting of 50 crocuses this weekend sound pretty puny:) I'm surprised you had only a blister after this; my knees would have needed some ice packs after being on them for 3 hours. Oh, but it will all be worth it come spring! I'm sure the garden fairies are going to love it, too. Go to a sports store and get one of their anti-blister products. One tube should last you a long time. Apply on your hand in last year's blister spot. Reapply when you take your breaks. That is, should you decide to plant another thousand crocuses next year. Still time to plant - but I don't know if I can handle hundreds of corms/bulbs. It does make a great show! Good to know about that special trowel. I planted Crocus tommasinianus in my lawn a few years ago because they were supposed to be squirrel resistant -- and they did, in fact, seem to be. However, the rabbits ate them after they were up for just a day. Is there a variety that's BOTH squirrel and rabbit resistant? Wow! That's a lot of crocus! Congrats on being so pro-active - you'll reap the rewards of your forethought in early spring.